As part of my #40×40 project, I’m adding 10 more statements of intention to the 30 I previously crafted to create my #40×40 Manifesto. Here are the next 9 to bring me to a grand total of 39. I’m saving #40 to see how the Spirit moves in the next year. 1. No guilt in life no fear in death. The truth is, I live under the weight of false guilt and irrational fear far too much of the time. I’m learning that God has a different plan for how I ought to live as His beloved child: forgiven and free of fear. This is the power of Christ in me. 2. For such a time as this. This is Queen Esther’s version of “bloom where you are planted”. Sometimes I forget that the positions and roles I have are at the centre of divinely ordained spheres of influence. Sometimes – though God doesn’t need me to accomplish His purposes – He gives me the privilege of bringing His voice into the conversation and the opportunity to be a part of his Divine Conspiracy. 3. Take it off the table. I have been exploring the importance of abstinence disciplines (fasting, solitude, silence, simplicity, frugality) as they are often neglected in the Christian life. For the sake of growth and margin, I am learning that it is liberating to take things off the table, to abstain from certain things – even if it is just for a time – to jolt me from my complacency. For example, for Lent this year, I am fasting from bread and wine and, recently, I have been contemplating what I can do – or NOT do – to break the hold that consumerism has on me. More on that in subsequent posts, I suspect. 6. Live like an overcomer. I often live defeated, as if I have no choice about my behaviour. I don’t feel much like a new creation. However, when I succumb to this temptation, I am believing a lie. We have been promised that old things have passed away and that the power of the Holy Spirit is within us to give us hope. So I do NOT need to live as a slave to my weaknesses, I’m more than a conqueror. Lord, give me strength to live the overcomer life. 7. Work the slight edge. I believe I have dangerously underestimated the impact of small steps in the wrong direction. Though it may seem like those little choices don’t add up in the short-term, in the long-term small increments add up to large outcomes in the direction of your choices. As my friend Bob Wiley would say, “if you’re baby-stepping, you’re doing the work!” The slight edge offers encouragement to those of us who might be afraid we are incapable of making big changes because the big decisions seem overwhelming. 8. Be thrifty. There are many good reasons to shop at second-hand or consignment stores, not the least of which involve the stewardship of environmental and financial resources and the lessening of one’s slavery footprint. (I am saddened by the estimate of how many slaves work to support my lifestyle and I want this to change. Determine your own footprint by answering the survey here.) Most of my house is furnished and decorated with free or thrifted hand-me-downs (or salvaged items on their way to the dump). With very few exceptions, my living room is decorated with someone else’s cast off items and I find it quite warm and inviting, don’t you? The truth is, I don’t have to spend what I often think I have to spend and I want to remember that new is overrated. 9. 65, stay alive. At Queen’s, we had this slogan to remind us to keep our priorities in check and not let school work steal our lives away; as long as we maintained a 65% average, we could stay in our programs and on track, academically. Giving 110% is basic over-spending in the energy department and it is not a sustainable plan if I want my relationships to have priority. Andy Stanley’s small but mighty book, Choosing to Cheat: Who Wins When Family and Work Collide?, offers important wisdom to those of us who need to learn to cheat properly. Work is not the place to spend myself. 65% is reasonable. 65% is good. 65% is enough. So, those are the updates as I head into my 40th year. Can you relate? Any suggestions for my 40th intention? 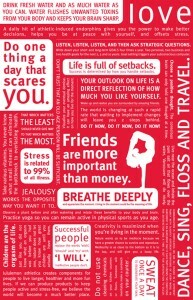 What are some of the statements that you would include on your manifesto? I recently challenged my “moms monthly” group to develop a personal manifesto to capture their intentions for living, particularly because, as moms, it is so easy to lose sight of our hopes and dreams amidst the chaos of a busy life that struggles to find work-life balance. I have used manifestos in a variety of ways as a classroom teacher (and often do workshops in my classes to help in the creative process) but I rarely take the time to reflect and package my own thoughts in this way, though I believe very strongly in their value. Having a visible reminder in your home that summarizes your thoughts about how you wish to live can help to orient you to carry out your intentions in day-to-day living. Although my blog version does not look like the lovely side panel of a Lululemon bag, AnnVoskamp’s 25 for Sanity Manifesto is the inspiration for my decision to revisit this concept. That woman is so wise and, well, inspirational! The interruption is the opportunity. I’m notoriously bad for becoming irritated by interruptions to my best laid plans. Choosing to see the change of plan as a divine appointment is something I am mindfully working on at work and home. Take it bird by bird. Anne Lamott’s brilliant book reminds writers – and all people, really – to take life in manageable steps. Whenever I begin to muse about anything beyond the next step I instantly feel overwhelmed. Wisdom: Do the next right thing. Repeat. Embrace freedom. Though I am ashamed to admit it, many of my choices and decisions are a result of fear. It seriously needs to stop as it is a defeated and deflated way of living. Daily, I’m going to claim the promise that perfect Love drives out all fear. Share. When our family accepted a sermon challenge to develop a “family mission statement” we agreed on this simple but meaningful word. We are committed to share all that we have been given – hospitality, resources, insight – because that is what it means to be a Covey. Let it go. (Don’t worry this is NOT an allusion to Frozen; please stay with me.) “Hello, my name is Sarah Covey and I am a control-freak and a security junkie.” If I could join a 12-step program to recover from either of these addictions, I would. Because it would provide a PLAN. I’m obsessed with plans. Have you ever noticed, though, that plans often change? I need to let go of my compulsion to have everything fall into place as I had orchestrated or expected and hold my plans loosely. Letting my agenda go for the sake of something better seems much more fulfilling. See #2. Give presence as a present. I am easily distracted and struggle to focus on one thing at a time but I have learned that multitasking sabotages relationships by undermining the authentic connection that can come from active listening and attentiveness in the moment. This undivided attention may be one of the best gifts I can offer my loved ones. Pray first, think later. I tend to make my requests known to every other person in my life before praying. Better to pause and start with the Big Guy so that my thoughts are formed in the context of spiritual strength and wisdom instead of human weakness and stupidity. Book daily stillness appointments. For some time, I have been committed to Sabbath-keeping but it is not enough to only rest once a week if every other day is a flurry of activity. There have to be moments in each day where I can pause, be quiet, and catch my breath. Thinking a gentle reminder on my cell phone for some adaptation of the Seven Sacred Pauses is going to help promote this daily discipline. Strength for today and bright hope for tomorrow. This classic hymn lyric has been a daily mantra, reminding me to trust in the One whose joy IS my strength. Nourish with the right bread. I’m a stress eater and I need to be a stress reader. I desire to be the person who goes to the Word to be nourished by the Bread of Life instead of trying – always unsuccessfully – to satisfy my hunger with Lays Potato Chips. Seek ways to touch a soul through the touch of a hand. When you don’t know what to say or do, resort to snuggle therapy. Physical touch has healing power. I know this to be true. Sometimes a loving touch can transcend words and render them unnecessary. Let nature nurture. Being surrounded my nature instantly calms my anxious heart and allows me to return to a life-giving rhythm. A long walk on the beach, a quiet moment on a park bench, or a cup of tea beside a glassy lake does restore my soul. Play music. Making a joyful noise helps to lift my spirits and channel my emotions. Listening to music can set – or change – the tone of a room with very little effort. Impromptu dance parties are always a good idea – and they tend to work better with a soundtrack. Cultivate creativity. Find ways to express myself creatively – through music, art, crafts, writing, decorating etc. I really think that” it is not how creative I am but how I am creative” (to adapt a common phrase), given that I am a child of the Creator. I need to make space for that aspect of God’s image in my life. Match time and energy to priorities. I’m pretty adept at managing my time but I’m not so great at managing my energy. I need to pace myself so that I retain some of my get-up-and-go for my family. Though they are my priority, they tend to have their time with me at the end of a long work day when I am depleted and weary. Saving some energy and/or sharing high-energy times with them when I can is a way to communicate how important they are to me. Moisturizing matters. This may seem like a rather trivial intention but I am the worst person for letting my very sensitive skin become parched. A little ritual of moisturizing with a rich cream is a mini-luxury that I really can’t afford to forgo. Baby steps, though. My facial care regimen needs a total overhaul but that is an adventure I’m not ready to face (pun intended). Let restlessness give way to rest. When I find myself striving and itching to do, sometimes the best thing is to stop and release the struggle and the full mind to the rest of God. This can be extremely liberating for my Type-A compulsive tendencies. Slowly, I am learning to let go of the need to accomplish something and to embrace the art of being. Unplugging from the noise in my mind and in the world can be a soul-enriching experience, right? Consider the value. It is not uncommon for me to spend money without thinking and this poor stewardship is disheartening. If I simply pause to consider whether a particular purchase is truly worth it I would avoid a lot of impulsive spending in the name of retail therapy. Let words and The Word sink into the soul. Clearly, I am a lover of language but, like many things in life, less is often more. Rather than skimming words, I want to savour them, to let them sink deep into my soul and change me. I want the words to become a part of who I am. Leave work at work. I have been able to set better boundaries over the years in terms of physically carrying work home but I’m always in a battle for my head space. Choosing to disengage from my professional life and to reengage with my personal life is essential to the healthy balance I am trying to achieve. Speak and spread kindness. Actions can speak louder than words but what I say matters, too. Random acts and words of kindness can go a long way in a world that can be cruel and inconsiderate. I try to model kindness because it is possibly the most important character trait that I wish my kids to emulate. Always kiss each other goodnight. This saying is on a plaque in my bedroom and it reminds me to make my marriage a priority. I am blessed to have each day end in the arms of my best friend and I never want to take that love for granted. Make best intentions a reality. I have these little instincts and inklings that I can’t explain that compel me to be in touch with a friend or to reach out to someone in need in some way. I have never regretted following through with those promptings but I have felt that ignoring or putting off responding to that inner voice has resulted in a missed opportunity to make a significant difference in someone’s day. I resolve to put my love into action. Meet perceived needs. All of us are needy but we may not be aware of deeper soul-needs because we are blocked by the tangible needs in our lives. Someone may ultimately need a restored relationship with Jesus but s/he may only be able to see the need to resolve conflict in a personal relationship. If I can help meet the need on the radar of the person in my sphere of influence, meeting that need will provide the opportunity to continue to speak about deeper truths. Like the saying (attributed to St. Francis of Assisi) goes, “preach the gospel and, if necessary, use words”. Seek first to understand, then to be understood. Another clever Covey suggested that this is one of the habits of highly successful people. I think about it in these terms: when you enter a room do your words and actions communicate, “here I am” or “there you are”? I want to be a “there you are” person who considers others first. Eat less, move more. My first formal manifesto was created as a result of my intention to live a healthier life. The specifics are here and they still hold true. This expression makes it feel manageable though, so I cling to it’s simplicity. Eat a frog before breakfast. This principle has been popularized in the business world but is solid advice for managing daily tasks and avoiding procrastination: get the thing that you are most dreading out of the way first thing and your day can only get better! Blog it. Maybe I won’t always want to post my entries for the masses but processing my joys and challenges “on paper” is cathartic, creative, and clarifying. Reflecting and writing is time well spent. So, what intentions might make your top thirty? Have you ever considered creating a manifesto? If so, what prevents you from following through? Leave your comments below – I love to hear from you!